Jennifer Eggleston, MSST Graduate Student and Conservation Technician for the Center for Southwest Research and Special Collections. “A box is just not a box. If you open one up, you will see how it is specially designed for each object.” -A quote by Jennifer E.
Jennifer began working as a Conservation Technician in the Center in February of this year (2018). 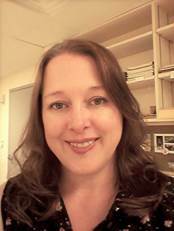 Although she is new to this staff position, Jennifer is not new to the Center or the field of conservation and preservation. Rather, Jennifer initially started working for the Center in early 2015 as a student employee. Specifically, she worked as a Preservation Assistant while taking classes for her Bachelors of Arts degree in Anthropology, with a minor in Museum Studies. In that role, Jennifer became familiar with archival materials and methods and the importance of handling rare and fragile items with care and detail. 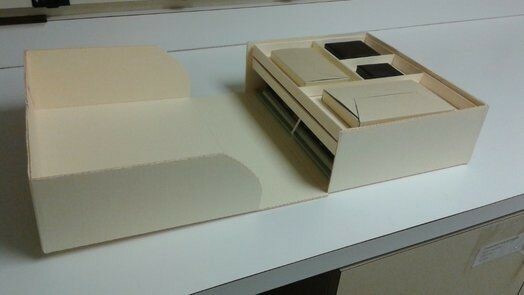 One of her primary responsibilities was to make custom enclosures for collection items; this included clamshell boxes, four-flap boxes, Mylar encapsulations, and dust jackets. (See “Examples of Jennifer’s Work” below.) In time, she began to take on additional duties, including minor repair and restoration and documenting and writing condition reports for items going out on loan. She also received further instruction and training on proper preservation techniques and theory. During her time with the Center, Jennifer has helped design, construct, and display items for a number of library lectures and shows, including the Willard Lecture Series’ displays, Route 66 exhibit, and the LOBOMANIA! exhibit. While assisting with these projects, Jennifer’s responsibilities have been quite diverse. For instance, she has conducted research, retrieved items, built stands, book cradles and back drops, as well as helping with the layout and final design of the exhibit. Some of the items that she has worked with are uniquely shaped, and this has enabled her to apply her creativity and come up with individual solutions to displaying and preserving them. In fact, one of the reasons she enjoys working in the Center so much is the ability to keep a sense of creativity in the work that she does. That – along with amazing special collections, awesome co-workers, and a beautiful campus – make for an overall great working experience according to Jennifer. Jennifer is currently a graduate student in the Museum Studies M.A. Program, and she has found that the program has been quite helpful with her work in the Center. She has already taken a number of classes including the following: Conservation Practice, Archival Practice, Museum Exhibit Design, and Museum Interpretation. The knowledge and skills learned in these classes have been quite applicable to all that she does in the Center on any given day. Jennifer had the opportunity to work on the William Whipple Collection, which is a collection of military journals, account ledgers, maps, correspondence, personal papers, etc. of U.S. Army Major General William Denison Whipple. Kaylen Jones combines her love for art and wolves with her position at the Museum of Southwest Biology. While purusuing her Masters in Museum Studies at the University of New Mexico Kaylen Jones has works as a Museum Tech at the Museum of Southwest Biology. As the video notes, one class in Museum Practices has changed her life and career path. Were excited to follow her educational and professional career. I am a graduate student at the University of New Mexico working on a master’s degree in Anthropology with an emphasis on Public Archaeology. As a Graduate Assistant (GA) in Museum Studies, I assist the Curator of Ethnology at the Maxwell Museum of Anthropology with the collections. These collections are surprisingly varied, ranging from hundreds of kachina dolls, Navajo rugs, and Native American baskets to Maya textiles, contemporary Pueblo pottery, and African sculpture and metalwork. My duties include researching the origins and artists behind recently donated objects, accessioning objects in the database and on paper, guiding visiting researchers and students, assisting with moves and inventories, and cleaning and treating objects. Having never worked in a proper anthropology museum before, I am finding each of these new experiences valuable. After graduation, I hope to continue in anthropology and archaeology in either a museum or in the field. Steve Maness is a second year student in the interdisciplinary Master of Arts program, through the Latin American & Iberian Institute where his focus is Pre-Columbian Art History and Anthropology. He has been a Graduate Assistant in Museum Studies since Spring of 2013. Steve’s program has a direct and shared interest with Dr. Traxler’s (our Director) prior accomplishments in Maya Archaeology. In addition to direct access to Dr. Traxler’s experience and attentive guidance, his Graduate Assistantship lends valuable insight and training toward his future plans to be a college instructor and work for cultural organizations. Steve is the first person in his family to attend college and therefore invests heavily in helping others toward success. He has served as Co-Chair on the Graduate Professional Student Association Grant Committee and currently represents graduate student interests on the President’s Cabinet. Because of his diverse, non-traditional background combined with his passionate investment in community enrichment, he was an American Alliance of Museums Fellow at the spring annual meeting in Seattle, Washington. In Fall 2014, he was nominated for the prestigious 2014 Sarah Belle Brown Community Service Award. Prior to pursuing a Master of Arts in Latin American Studies, Steve earned a B.A. in University Studies with an emphasis in Ancient Cultures. Steve’s interest in Museum Studies is the result of a rich background as a musician (instrumental and vocal) through work with esteemed trainers, including Kim S. Shelley (percussionist) of the Saint Louis Symphony Orchestra and vocal coach Maralin Niska of theNew York Metropolitan Opera. He was adopted and raised on his grandparent’s farm in the township of Old Mines, Missouri. He eagerly welcomes questions or opportunities to help others in their pursuit of higher education, community service or personal development. I am a graduate student at the University of New Mexico working on my master’s thesis in Anthropology and completing a graduate minor in Museum Studies. 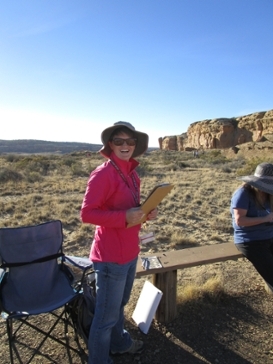 Most recently, I have been doing fieldwork at Chaco Culture National Historic Park in Northwestern New Mexico. Here, I am working on a project aimed toward understanding how visitors at Chaco utilize the interpretive materials provided by the National Park Service. In particular, I am interested in gaining a better understanding of what visitors learn and don’t learn from the material provided. To see Chaco from both a visitor’s and an interpreter’s point of view, I have conducted personal interviews with park rangers, volunteers and visitors. I have also developed a comprehensive visitor’s survey which I’ve had the opportunity to administer over several weekend visits. Once I finish my study at Chaco I intend to present my completed work to the Park Service staff and at various academic conferences. In addition to my fieldwork, I also volunteer as a student docent at the Maxwell Museum of Anthropology, leading school group tours. By combining my studies with these experiences, upon graduation I hope to work in a museum in an education capacity, creating exciting curriculum for museum visitors, specifically children.